As I’ve mentioned before, my approach to school lunches is taking a hybrid strategy: a combination of homemade items, fresh produce, and some healthy store-bought foods to make assembling lunch (relatively) stress-free. These Super Seed Pumpkin Energy Balls are one of my favorite homemade lunchbox treats because they’re easy to make, wholesome, and freezer-friendly. My daughter loves them because they’re the perfect size for her little hands–and they taste good. That doesn’t mean you have to be a kid to enjoy these pumpkin spiced snacks–nope! They’re great for a little afternoon energy boost or for after working out. 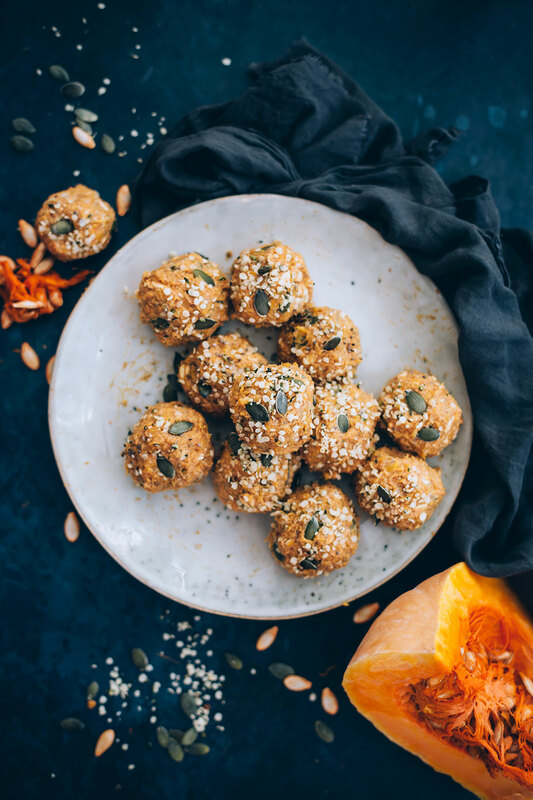 With sunflower seed butter, pepitas, hemp, and chia seeds, they’re full of healthy fats and plant-based protein, while the oats have you covered in the grain department, and the pumpkin adds fiber and vitamin A. Because I make these for my daughter to bring to her nut-free school, I make this recipe with sunflower seed butter. If that’s not a concern for you, any other nut butter can be substituted–almond butter is especially good. 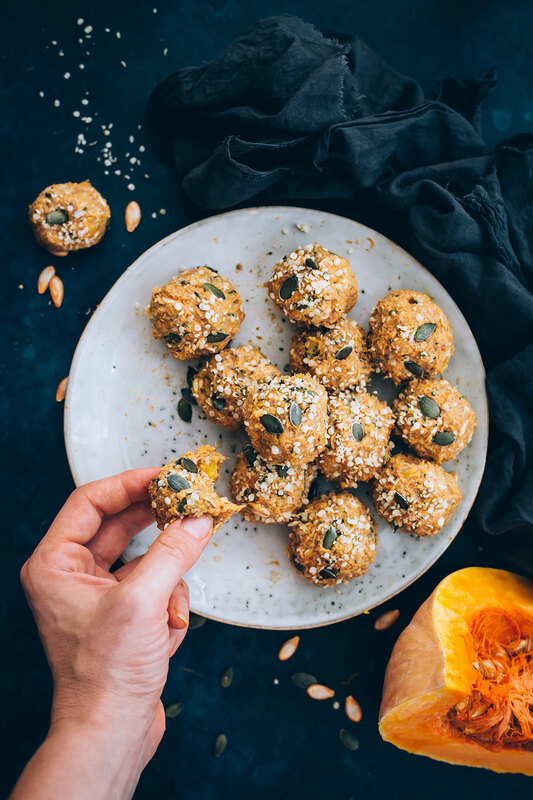 You’ll want to store these pumpkin energy balls in the refrigerator or, even better, in the freezer–they’ll last longer that way (up to 2 months) and if you put them in a lunchbox, they’ll be the perfect temperature for eating by the time lunch rolls around. A make-ahead lunchbox treat made with pumpkin, oats, and lots of healthy seeds. 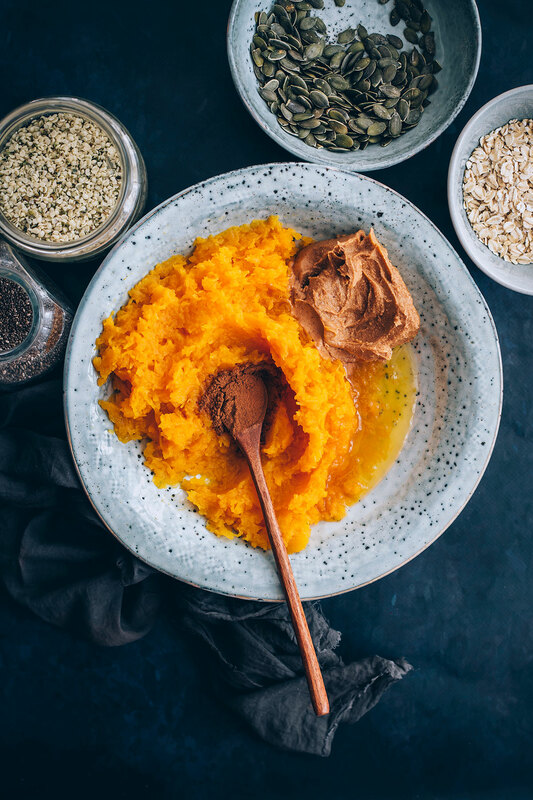 Combine the sunflower butter, pumpkin, maple syrup, and pumpkin pie spice in a large bowl and stir until smooth. Fold in the remaining ingredients. Refrigerate the mixture for about an hour, or until it's chilled and easy to work with. Roll the mixture into balls. Store the finished energy balls in the refrigerator or freeze and thaw for a few minutes before eating. Any nut or seed butter can be substituted for the sunflower butter.